Daughter of Hazart Inayat Khan (great grandson of Tipu Sultan), Noor (meaning light of womanhood) was born in Moscow on 1st January 1914. Noor was of a diverse heritage with her father working as a musician and teacher of Sufism while her mother Ora Ray Baker was an American from New Mexico who met Hazart while he was travelling in the USA. In 1914 on the eve of the First World War, the family moved from Russia to the UK with the young Noor attending a kindergarten in Notting Hill. In the early 1920s the nomadic family moved again this time settling in a house near Paris which had been left by a supporter of the Sufi movement. When her father died in 1927 Noor became head of the family looking after her mother and the younger members of the family, giving the confidence and abilities she would later use in her wartime role. She proved to be an intelligent if dreamy student studying psychology and music at the Sorbonne. After her studies she made a name for herself writing children’s stories, the most famous of which her “Twenty Jataka Tales” was published in 1939. It was during the Second World War that Noor was to earn her place in history. With the German invasion her family fled to Britain arriving in June 1940. Noor’s pacifist upbringing did little to discourage her from helping the war effort and she seemed to find war exciting. In November 1940 aged 26 she joined the Women’s Auxiliary Air Force (WAAF) and it was here that she learned her wireless operating skills which were to become so important to her in her later role. In 1942 she was recruited by the infamous Special Operations Executive (SOE) F (French) section due to her wireless and language skills. She was a less than ideal trainee with many instructors expressing concerns about her ability and aptitude for the job. During a mock interrogation she broke down in tears and appeared terrified. in fact she failed to complete several aspects of her SOE training but she spoke fluent French and was a good wireless operator and the need in the Paris area was great. Noor became the first female radio operator (women sent previously had been couriers) to be sent to France by SOE. Code named ‘Madeleine’ also known as operator ‘Nurse’ Noor landed in France on the night of 16th/17th June 1943 travelling on a Lysander aircraft favoured by SOE for the infiltration of agents. Together with two other women Diana Rowden (‘Chaplin’) and Cecily Lefort (‘Teacher’) Noor made her way to Paris. Noor did not make a good impression on her new team-mates at one point leaving a code book out on open display! This was not a good time for SOE as in the following six weeks many of the radio operators in the Paris area were caught by the Germans and Vichy French authorities. Noor continued despite becoming very isolated, frequently moving from place to place and avoiding capture with skill and daring. The normally quiet Noor seemed to thrive on the danger and refused offers to be withdrawn back to Britain. Finally 1st October 1943 Noor’s luck ran out when she was betrayed by another SOE agent to the Germans, possibly by the double agent Henri Dericourt or by Renee Garry who may have betrayed Noor for money or out of jealousy due to her rivalry with Noor for the affection of a male SOE agent. After a fierce struggle with the Gestapo officer sent to arrest her she was taken to the SD HQ at 84 Avenue Foch. Noor proved very resilient to interrogation and repeatedly tried to escape, once climbing out onto an upper floor drainpipe after asking to take a bath and explaining to her guards that a lady does not bathe in front of men. While the guards waited outside she climbed out of the bathroom window. Hans Kieffer at that time head of the Gestapo in Paris made reference to Noor’s composure and resistant to questioning in his diaries. Despite the fact that Noor told the Germans nothing they did find her code books and a diary of her messages allowing them to send false messages in her name. A few in SOE suspected due to discrepancies in the messages that she had been captured but these concerns were dismissed by senior officers. Due to this the Germans captured three more SOE agents on landing. Due to her repeated attempts at escape and the failure of the questioning Noor was moved to Germany at the end of November 1943 and imprisoned at Pforzheim. Here she was treated as a dangerous prisoner with her hands and feet chained and kept in solitary confinement. Despite this harsh treatment and likely torture at the hands of her captors Noor still gave nothing away and was defiant to the end. On 11th September 1944 Noor along with several other prisoners was moved the notorious Dachau concentration camp, 2 days later after a vicious beating at the hands of the SS guard Wilhelm Ruppert, Noor Inayat Khan and three other women were taken to some woods near the camp and shot. A Dutch prisoner later testified that defiant to the end Noor’s last words were “Liberte”. Noor was posthumously awarded the highest none battlefield British Award the George Cross. Noor Inayat Khan is interesting for more reasons that just her bravery but also in the role she played in the raising the profile of women and ethnic minorities - not at the time of her death but in the years that followed as her story became more widely know. It is worth remembering the nature of British society at the time, and it is all too easy to look back on Noor from a modern perspective. The role of women in society was changing but had a long way to go, it was not that long before Noor that women had gained the vote and the image of women taking any active part in warfare let alone operating as an agent in occupied territory rather than being home makers and wives was still very alien to many. Add to this the fact that Noor was of mixed heritage and the idea of Indian independence was a very controversial subject in Britain. In fact Noor was very outspoken on this subject, unsurprising considering her background and believed that she would not get her commission due to open support for Indian Independence. Noor hoped that the bravery and service of Indians during the war would help “Build a Bridge between the English and the Indians”. The bravery of Indian servicemen and women during World War 2 is without question with many earning Victoria and George Cross medals. Noor’s Story was highlighted again during an excellent BBC ‘Timewatch’ documentary in May 2007. 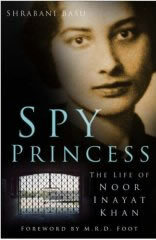 Spy Princess: The Life of Noor Inayat Khan, Shrabani Basu. A detailed book covering the story of Noor Inayat Khan one of the most famous SOE agents in World War 2. A well written and moving account of a young girl’s bravery with excellent research which answers many questions about Noor’s final fate that were left unanswered for many years. It is a fitting tribute to this young Indian woman’s bravery and sacrifice and is a moving biography.